Bulking Agents: Maltodextrin & Microcrystalline Cellulose, Magnesium Oxide, Vitamin C (Ascorbic Acid [Carriers: Hydroxypropylmethylcellulose & Tartaric Acid), L-Carnitine Tartrate, L-Tyrosine, Vitamin E (D Alpha Tocopheryl Acid Succinate) (from Soya), Zinc Sulphate, Tablet Coating: (Glycerin, Hydroxypropylmethylcellulose, Natural Source Colours [Iron Oxides], Talc), Niacin (as Nicotinamide), Anti-Caking Agents: Silicon Dioxide, Stearic Acid & Magnesium Stearate, L-Lysine Monohydrochloride, L-Arginine, Thiamin (Vitamin B1 as Mononitrate [Carrier: Hydroxypropylmethylcellulose]), Ferrous Fumarate, Citrus Biofavonoids, Pantothenic Acid (as Calcium Salt), Vitamin B6 (Pyridoxine HCl), Siberian Ginseng Extract, Natural Mixed Carotenoids (Betacarotene, Starch, Water, Antioxidant: DL-Alpha Tocopherol), Vitamin A (as Acetate [Carriers: Maltodextrin, Gum Acacia, Corn Starch, Antioxidant: DL-Alpha Tocopherol]), Co-Enzyme Q10, Vitamin D3 (Cholecalciferol [Carriers: Acacia, Sucrose, Corn Starch, Medium Chain Triglycerides, Antioxidant: DL-Alpha Tocopherol]), Ribofavin, Crosslinked Cellulose Gum, Octacosanol (Rice Bran), Copper Sulphate, Manganese Sulphate, Folic Acid (as Pteroylmonoglutamic Acid), Potassium Iodide, Biotin, Vitamin B12 (Cyanocobalamin). Allergy Advice: For allergens, see ingredients in bold. Food supplements must not replace a balanced and varied diet, and a healthy lifestyle. As with other supplements, consult your doctor or pharmacist before using if you are under medical supervision, have epilepsy, a thyroid disorder, haemochromatosis, suffer from food allergies, or are allergic to any of the ingredients. Not suitable for children under 12 years. Allergy Advice: For allergens, see ingredients in bold. 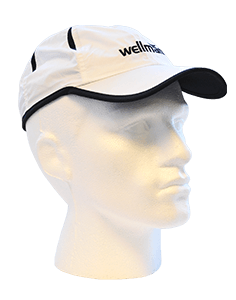 Why has Wellman Sport been developed? 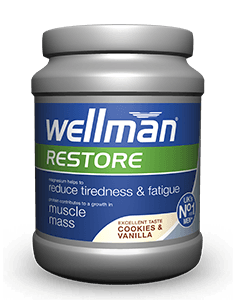 Is Wellman Sport a body building supplement? 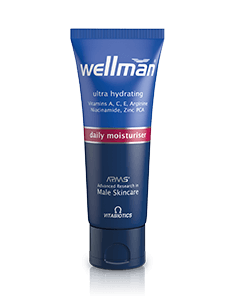 What is the difference between Wellman Sport and Wellman Original and should they be used together? Can Wellman Sport be used simultaneously with medicines? How many tablets does one pack of Wellman Sport contain? 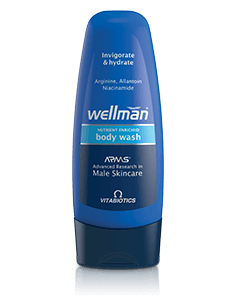 How and when should Wellman Sport be used? 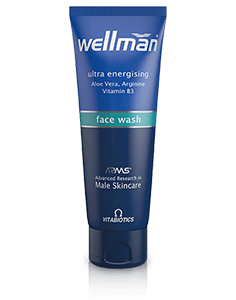 Are there any undesired effects whilst taking Wellman Sport? 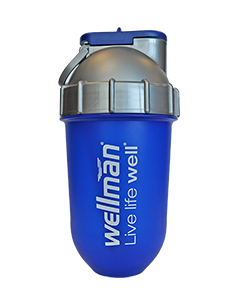 Wellman Sport has been developed specifically for men training to excel in sports and fitness. 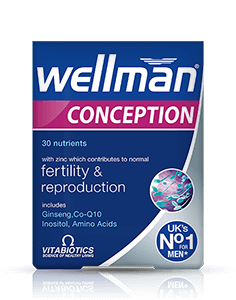 Wellman Sport’s comprehensive formula helps to maintain optimum levels of nutrition and contains valuable nutrients which can support performance during sport and training. 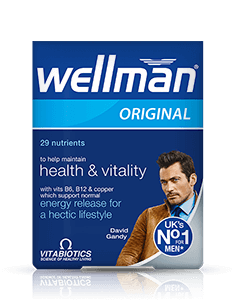 Wellman Sport is not a weight or muscle gain product, as they often do not provide a balanced source of the daily vitamins and minerals needed; rather it provides all round, balanced multivitamin support that can be taken every day. 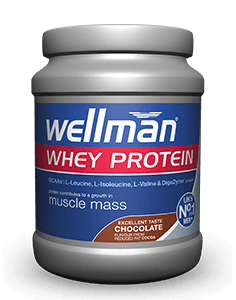 Wellman Sport is not like a 'muscle gain' protein formula. 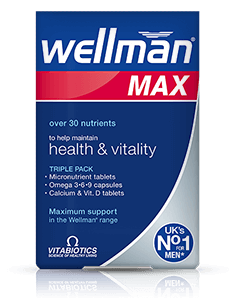 It is a balanced multivitamin formula, ideal to help maintain all round health on a daily basis in those involved in sport. 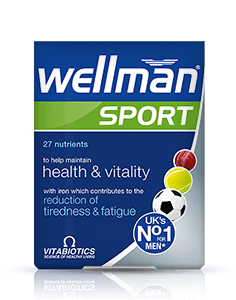 Wellman Sport is an all round nutritional supplement combined with specific support to assist in training & fitness programmes. 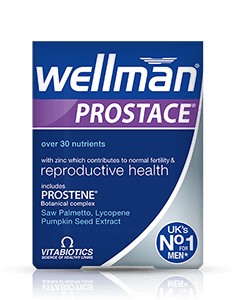 Wellman Original has been specially developed to help maintain general health and vitality in men of all ages. 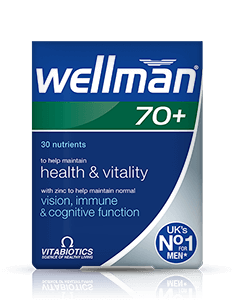 Wellman Sport and Original are designed to be used on a daily basis, and as they are both complete multivitamins are not intended or required to be used simultaneously. There is no need to take an additional multivitamin alongside either product. 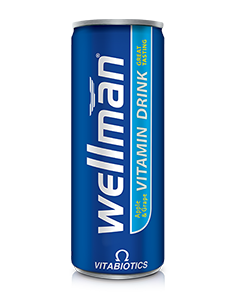 Generally, Wellman Sport may be used alongside medications because it contains only moderate levels of vitamins and minerals, and it is free from any drugs and hormones. 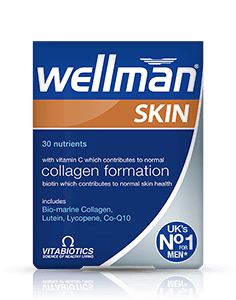 For specific advice on taking Wellman Sport with medicines, we recommend that you contact your doctor or pharmacist before use. One tablet should be taken with or immediately after your main meal, with a glass of water or cold drink. Taking the tablet with a large meal maximises the absorption of the nutrients. Wellman Sport should only be taken on a full stomach. 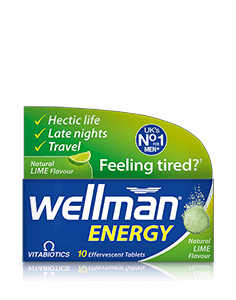 Always ensure that Wellman Sport is taken with plenty of liquid to wash the tablet down, and not tea or coffee, as this may cause the tablet to disintegrate too early. 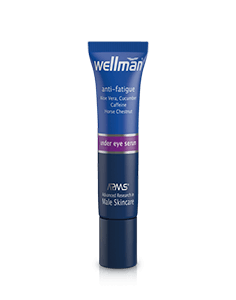 Wellman Sport has no know side-effects when taken as directed. Do not exceed the recommended tablet intake. 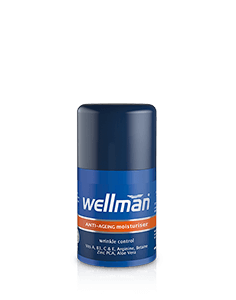 Wellman Sport is a non- addictive formulation, and is free from drugs and hormones.